Everton bounced back to winning ways against Burnley after enduring back to back defeats at the hands of Manchester City and Tottenham Hotspur. The Toffees scored five goals against the Clarets and would look to continue this form when they take on Brighton and Hove Albion in their next match. Brighton, on the other hand, suffered a defeat against Manchester United and would look to make amends for their mistakes when they lock horns with Marco Silva’s men. However, it would not be an easy task for Chris Hughton’s men despite playing in front of the home crowd. Marco Silva has a fully fit squad at his disposal for the clash against Brighton barring Ademola Lookman, who is nursing an injury and would be assessed ahead of the next match. After his nightmare of an outing against Tottenham, Jordan Pickford came back strongly and dished out a decent performance against the Clarets. He would once again start in goal for the Toffees in the next match. Yerry Mina and Michael Keane would start in the heart of the defence for the Toffees and would be accompanied by Kurt Zouma once more after their strong display against Burnley. Seamus Coleman would put in a shift from the right-hand side as wingback while Lucas Digne, who scored two brilliant goals in the last match, would start in the left wingback position. Idrissa Gana Gueye and Andre Gomes would once again pair up in central midfield after the Senegalese international missed out against Burnley. 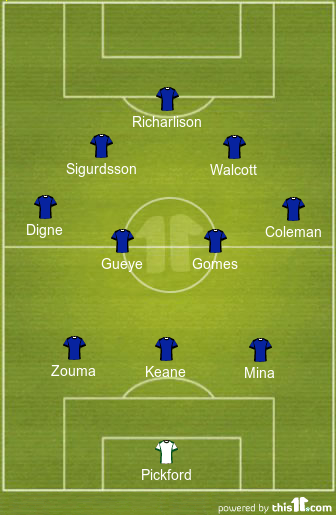 Gylfi Sigurdsson would start in the attacking midfielder position behind the striker. He would be accompanied by Theo Walcott on the flanks. Richarlison was back among the goals against Burnley as he came off the bench and would look to continue his scoring form against the Seagulls as well. He would lead the line for the Toffees. Tottenham Hotspur Forward Agrees Personal Terms With Galatasaray: Good Move For All Parties? Brighton And Hove Albion Defensive Star Signs A New Deal: Good News For The Seagulls? Sunderland Reject £2m Bid From Brighton And Hove For 23 Y/O Midfielder: Can He Fit In Under Hughton? Brighton And Hove Complete Signing Of 29 Y/O Former Bundesliga Ace: Right Man For Hughton’s Side? Brighton And Hove Albion To Swoop For Talented Brazilian Forward: A Good Move By The Seagulls?